If you’re like me, you probably love the new Wyze Cams. They are by far the cheapest smart security cameras, with Wyze Cam v2 costing you $25 after shipping. 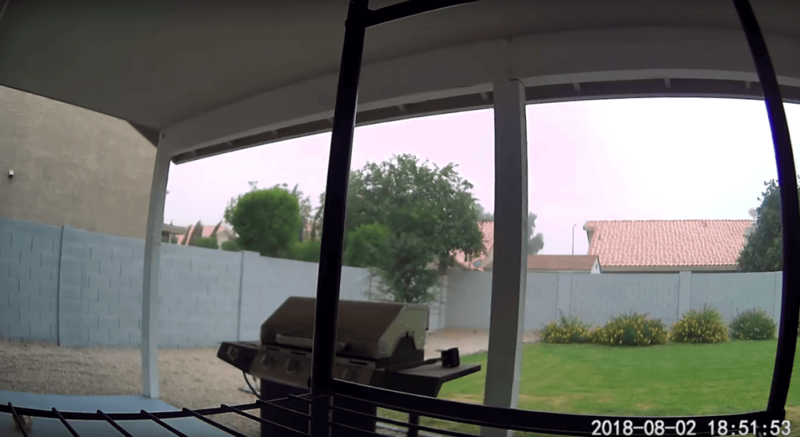 While it’s not designed for outdoor use, we wanted to test the Wyze Cam outdoors and see if we could monitor outside our home for that low price as well. You can watch our video below for a full demonstration of how we weatherproofed and tested our Wyze Cam. For this review, we installed Wyze Cam v2 on our back patio. We even poured water directly onto the camera to see if it would get ruined from direct rainfall. In this article, we’ll walk you through a few tips for installing the camera outdoors, and show you exactly how the camera held up to our testing. 7 Future Tech: Wyze Cam Outdoor? Affiliate Disclosure: This page has affiliate links, which earn us commission at no cost to you. The writers of this blog received a free sample of Wyze Cam v2 and Wyze Cam Pan for review. They were not compensated in any other way. The opinions are 100% their own and not influenced. Wyze Cam v2 and Wyze Cam Pan are not designed for outdoor use. The tips in this article and video are not guaranteed, and your camera could absolutely fail due to weather. With its super affordable price and impressive quality, it still makes sense why you would want to try using Wyze Cam outdoors. The camera has 1080p, night vision, motion tagging, works with Alexa, and offers 14 days of free rolling cloud storage. We compared it with Nest and Arlo and chose Wyze as the overall winner. It’s simply impossible to beat its specs for $25, which is why many Wyze Cam users are throwing their camera outdoors to see how it holds up. The risk of having our cameras ruined from rain didn’t didn’t stop us from using them outdoors, but we did take a few precautions during installation to give our cameras the best chance of survival. After we finished reviewing our Wyze Cam v2 indoors, we put Wyze Cam outside on a covered patio for more than 60 days. We picked the patio to help the camera stay covered from rain. Since we water tested the Wyze Cam and it held up pretty well (more on that later), I have a feeling it would do fine for some time even if it was installed in an uncovered spot. Footage from our Wyze Cam v2 under our patio. Maybe it would die after a while, especially if you live somewhere with heavy or prolonged rainstorms. Either way, if it’s an option then I recommend installing it under a patio or roof eaves for added protection. 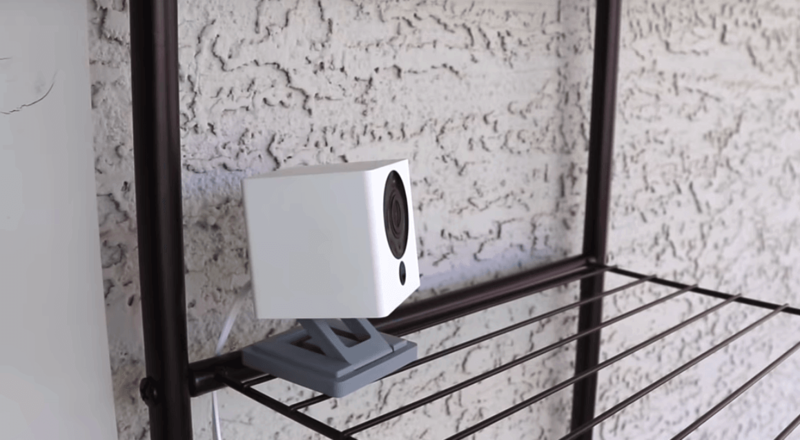 We simply installed our Wyze Cam outdoors on an inexpensive outdoor shelf. The shelf was metal, so the camera’s metallic base stuck on nicely and we didn’t worry about the camera blowing away. 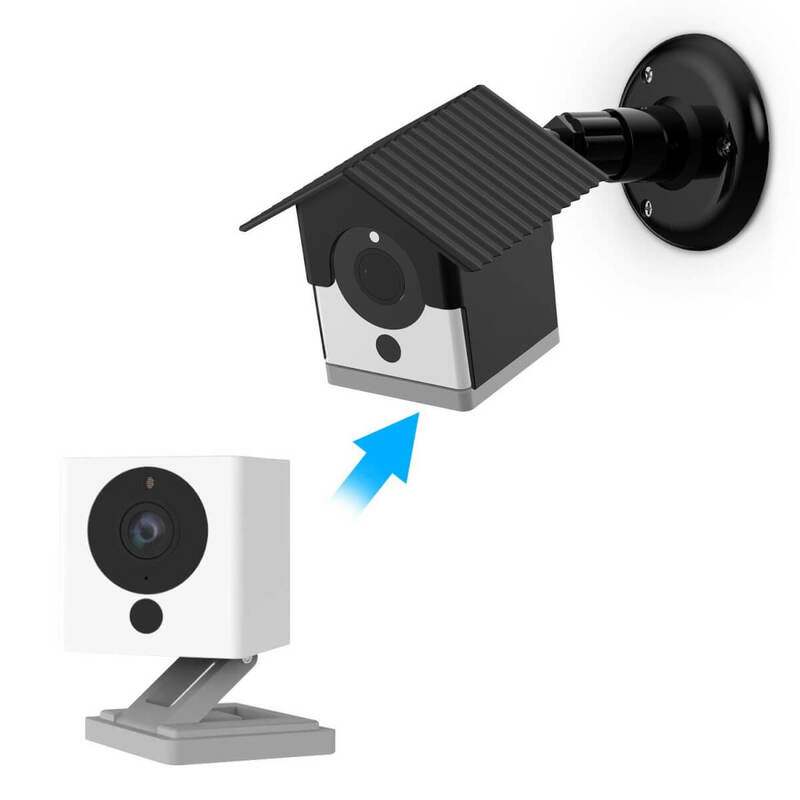 Another option is to mount your Wyze Cam to a wall if you wanted to, but you’d probably need to buy a separate mount for installation since the included 3M sticky mount likely wouldn’t work on exterior walls. For our first two months of outdoor use under the patio, our Wyze Cam was completely naked in the wild. In other words, it didn’t have any case or enclosure protecting the camera. During that time, there were several strong monsoons, dust storms, humidity, and high winds. See Wyze Cam v2 prices on Amazon.While this left plenty of damage around the neighborhood, it didn’t hurt Wyze Cam at all. Besides a little dirt on the exterior, the Wyze Cam looked as good as new. Its picture is still clear and it doesn’t appear to have dust or dirt behind the lens. 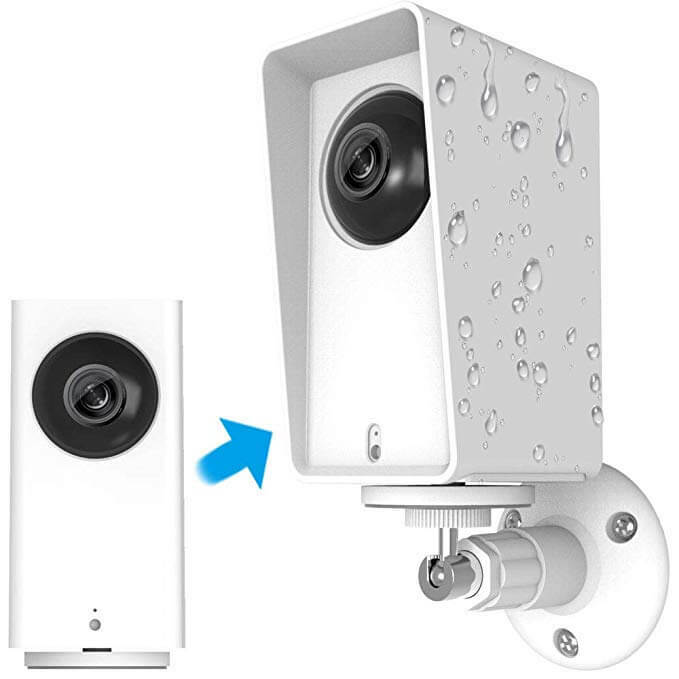 If you plan on keeping your Wyze Cam v2 under a covered patio, then purchasing a third-party case or enclosure isn’t completely necessary, but it can provide added protection. There are several options for third-party Wyze Cam v2 enclosures on Amazon. They are quite inexpensive, which is great because you don’t want to spend $50 on a case for a $25 camera. We decided to go with the highest rated Wyze Cam outdoors enclosure. They took the term “housing unit” literally… since the case looks exactly like a little house. It even has a roof. This case comes with an easy installation mount. Both the case and the mount are plastic. Screw the mount into your wall outside, then attach your Wyze Cam in its housing unit and your installation is complete. The case has a covered area in the back where the cord fits nicely, protecting this area from water damage. The roof design also keeps UV rays out of the camera’s lens. As you’ll read below in our water test, this enclosure was pretty effective at keeping water off of the camera, although it doesn’t completely waterproof it. It has a pretty snug fit that seals it tightly, and its roof shape lets most water roll right off. As Wyze Cam becomes more widely used, there are always more options for cases that can help you try to weatherproof the camera. Here are just a few other highly rated Wyze Cam v2 enclosures and mounts. Wyze Cam v2 Wall Mount and cover by Mrount. This case is also available in black. Wyze Silicone Cover and Wall Mount by Frienda. Again, other options are available, but we always consider it a small risk buying something on Amazon that doesn’t have strong reviews. 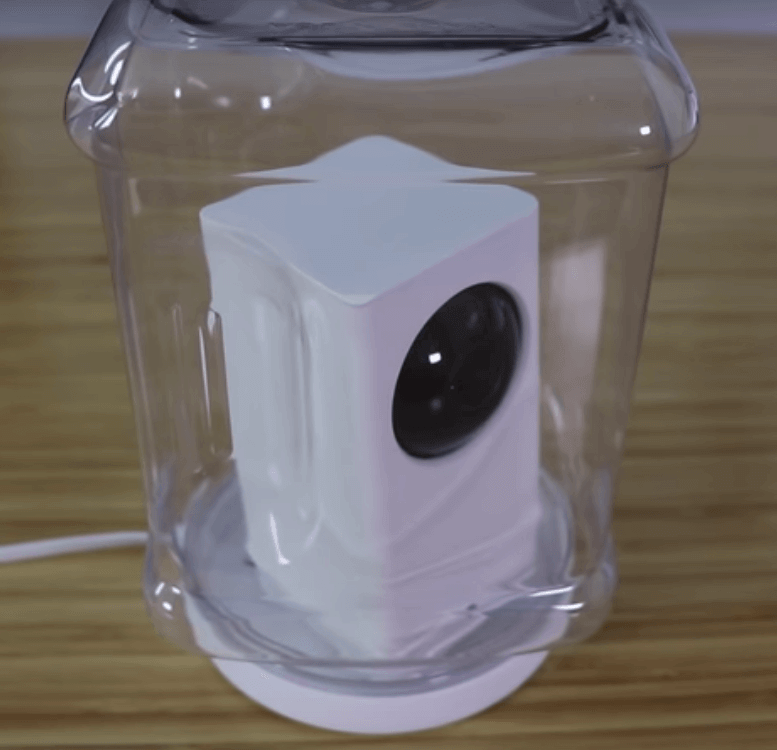 If you used a case for Wyze Cam that you like, comment below and we can add it to the article! Wyze Cam Pan is the larger, newer version of the original (for specs, see Wyze’s website). It can pan around the room, tilt up and down, and even track motion as it moves. There are a few good options for Wyze Cam Pan outdoor enclosures, but we decided to go the DIY route in our testing. We purchased a small plastic square jar from Walmart – I think it cost $2. By cutting a small hole for the cord to run through and then installing our Wyze Cam Pan inside, we were able to provide some water protection without spending too much extra cash. The jar was large enough that we could still pan the camera around without any difficulty. The picture was a little less clear, but not bad considering how well it was protected. The only problem is that at night the IR bounces off the case, so it’s not really a solution for the evening. We haven’t tested this case outside ourselves, but its design seems like it would help keep water off of the camera, while allowing it to pan around freely. There are also a few Wyze Cam Pan mounts without a case that come in packs of two and are very affordable. These don’t have a case for weather protection, but they may be a good pick if you’re looking to install your camera under a covered patio or the eaves of your roof. 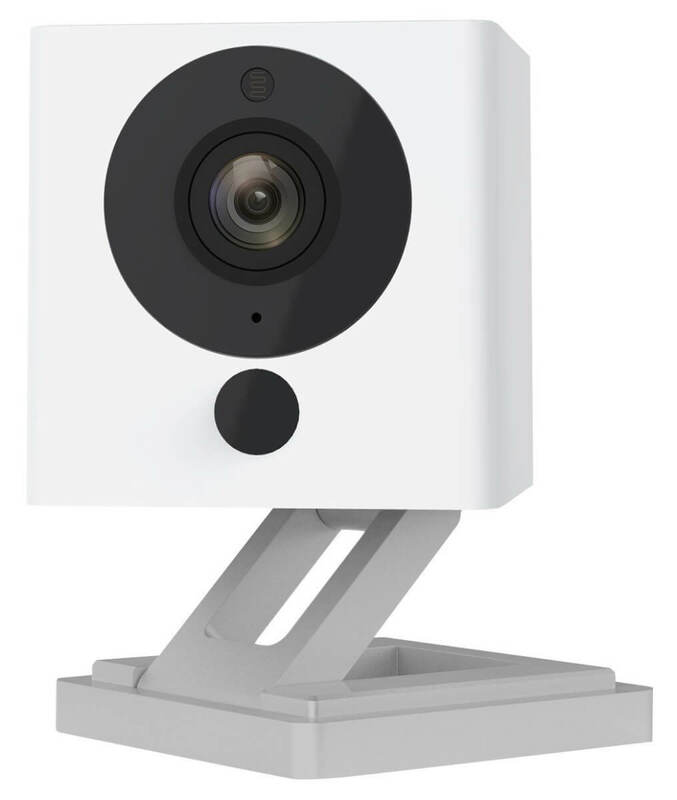 Since Wyze Cam Pan is the newer option between the two, there aren’t tons of cases to choose from, but I imagine more will be added as the camera grows in popularity and use. Now that we’ve covered installation and case options for your cameras, it’s time to test how the cameras really handle the outdoors. Since we live in Arizona and it’s summertime, we were limited in our test conditions. While there was some rain while our camera was under the patio, we still wanted to test the Wyze Cam outdoors with its enclosure under some direct rainfall to see how it would hold up. We aren’t usually this reckless with tech, but we feel a little braver when it’s only $25 to replace. 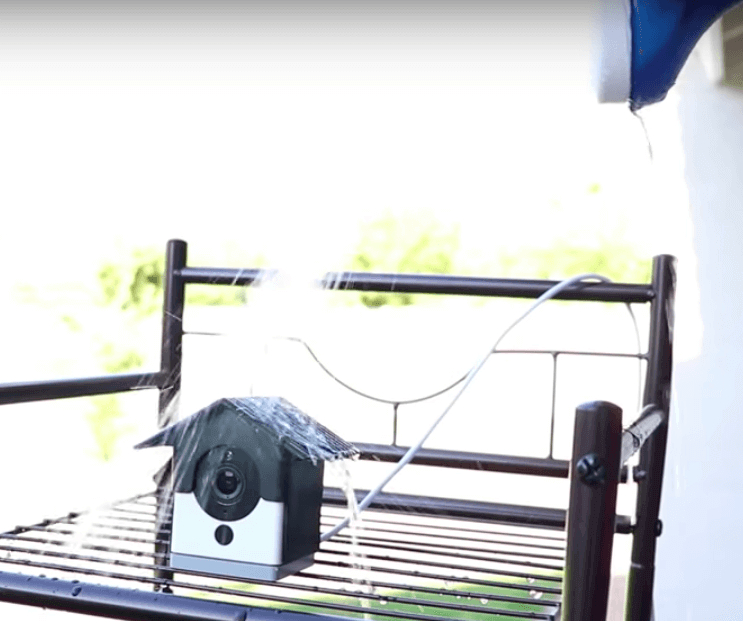 As you’ll see in our video review that we linked above, we poured a lot of water directly on the enclosed Wyze Cam. It didn’t receive any damage or soak up the water. The enclosure did an effective job keeping water off of the camera and its cord, but any droplets that ended up on the camera itself didn’t damage it at all. Note that the housing unit didn’t keep the Wyze Cam completely dry. It acts more as a shield from overwatering, but it’s not going to completely keep your camera dry. As far as temperature goes, we are feeling confident about Wyze Cam’s abilities to hold up in a wide range of temperatures. Outside, the temperature reached as high as 115° F. The camera survived living outside in Arizona in the summer, so it’s officially tougher than me since I love air conditioning. To test the opposite end of the spectrum, we put our Wyze Cam v2 in the fridge for a few days. It worked fine and was not disrupted by the colder temperatures. It did get a little condensation on the lens, but we wiped it right off. I’m unsure if this condensation would happen on Wyze Cam outside in colder temperatures, but I can test it in a few months during the wintertime and follow up. Again, Wyze Cam v2 is not approved by the manufacturer for outdoor use. No matter what conditions you decide to expose it to, you’ll want to keep an eye on the forecast and really consider bringing it indoors in extreme weather. You could even use your Wyze Cam outdoors whenever temperatures are mild in your city. Otherwise, you risk having your camera die due to weather conditions. Of course, that’s not the end of the world since the cameras are so affordable and easy to replace. Besides using an enclosure or keeping the camera under a covered patio, there are a few other options you might want to consider. These will help you monitor using Wyze Cam outside, as an inexpensive option. An interesting feature that both the Wyze Cam v2 and Wyze Cam Pan offer is the ability to daisy chain. This means plugging in the first camera to power, and attaching the next camera to the back of the first. 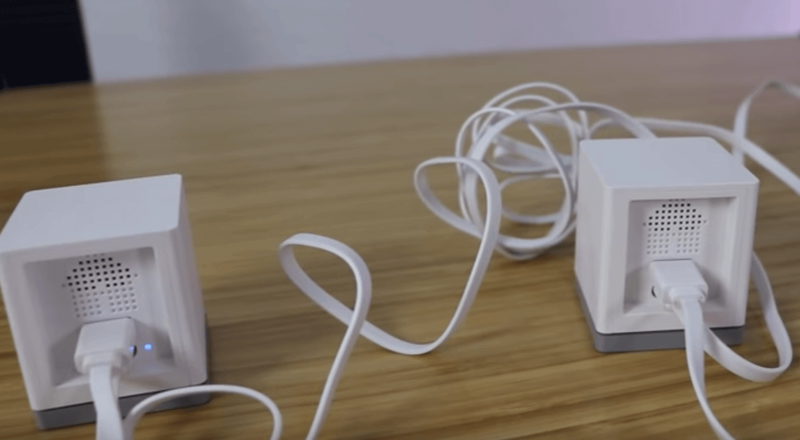 By plugging cameras into one another, you create a “chain” that can make it easier to power your cameras since they don’t all need to be plugged into an outlet. If you use more than one Wyze Cam outdoors, then you could easily daisy chain them together to make it easier to power them all. Many homes have few outlets on the side of their home, so this could be a good solution for that issue. As you’ll see in our video review, we daisy chained a few cameras together using a 25-ft power cord (see it on Amazon). It worked well and the cord was not too expensive. The maximum amount of cameras you can chain together is 3. Another option is to place your Wyze Cam in a window, where it can be completely protected from the elements, while still monitoring outside your home. One Reddit user implemented 3M tape to mount their camera directly to the window. While this option may help you keep an eye on the outside of your home, it is limiting in a few ways. First, you cannot use this at night since the camera’s infrared bounces off the glass, making the image look like a bright light and so it’s impossible to see anything through the camera. If you turn of the infrared and have bright lights on outside, then that may be visible by the camera at night. The other obvious issue with this is that you can only monitor areas directly outside of a window. If you want to keep an eye on the corner of your garage where there’s no window nearby, this isn’t a solution for you. Future Tech: Wyze Cam Outdoor? This article is focused on retro-fitting the Wyze Cam v2 and Pan cameras so they can work outdoors, but will there ever be a dedicated, weather-resistant Wyze Cam designed for outdoor use? Maybe a true Arlo Pro competitor? There’s been quite a bit of discussion on this topic in the Wyze Cam forums and the Wyze subreddit. It’s a question we had too, so we took to Twitter. Before we could even Tweet Wyze to ask, we found their response to someone else. As you can see, it looks like an outdoor Wyze Cam is on the way! For now, we’ll make due using our cheaper Wyze Cams outdoors, especially since other outdoor cameras are so expensive. Have you tried using your Wyze Cam outdoors? Let us know your tricks for helping it survive your local climate.